The first part of Cape Cod — confusingly called the “Upper Cape” by locals — is completely different from the rest of the area. Even though it’s the easiest part of the Cape to get to from Boston and New York, it tends to be passed over by eager vacationers speeding towards the honytonk of Hyannis or the beaches of the outer seashore. Because of that, it retains a small-town village-y feel, especially in the quaint historical centers of Sandwich and Falmouth, giving it the feel of a 1950’s — if not 1850’s — summer vacation. In keeping with this atmosphere, there are few big resorts in the area, where lodging tends to be in the form of historic inns and tidy beachside B&B’s. 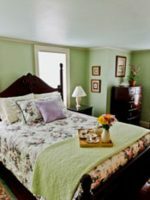 The trick can be finding one that offers that small-town cozy feel at the same time accommodates children without fuss. The Dan’l Webster Inn may just be the holy grail in historic but family-friendly vacation spots. Situated just a short walk from Sandwich’s achingly quaint town common, it’s got historic cred coming out of the eaves. Its origins as an inn date back before the American Revolution, when it was converted into a headquarters of the patriots during the war. Later in the mid-1800’s, the inn became a favorite of US Senator Daniel Webster, from whom it currently gets its name. As you might imagine from the precious spelling of the inn’s name, the property has gone to great strides to retain an historic feel — and out-of-towners looking for a little slice of Ye Olde New England won’t be disappointed with the creaky floorboards in the lobby and exposed beams in the tavern. The atmosphere here, however, is anything but stuffy. Within the last decade, the property was acquired by the Catania family, which also owns and operates the over-the-top family resorts The Cape Codder in Hyannis and The John Carver Inn in Plymouth. They’ve extended the same warm, family-friendly vibe to this property — staff goes out of its way to address kids and make them (and their parents) feel welcome, and even the formal dining room has a convivial atmosphere that makes it a local favorite for multi-age gatherings that pull in everyone from grandma to the newborn. You won’t find a bevy of children’s activities here at the inn — there’s no formal kids club or activity schedule — but if you are looking for a vacation on the quieter side of the Cape, this inn offers a pleasant and atmospheric home base from which to explore the surrounding area. The main inn and the Fessenden Wing in a separate building out back each offer standard rooms with two double beds as well as more spacious rooms with two queens or one king bed. Rooms are "individually decorated," which in practice means a somewhat mismatched collection of antique furniture pieces including armoires, writing desks, and the like, that is homey and comfortable. The newer Jarves Wing has smaller rooms but more luxuriously appointed rooms with four-poster queen beds. All rooms include air conditioning, cable TV, coffee makers, and free wi-fi Internet. Suites feature additional amenities, including refrigerator, DVD players, a choice of pillows -- goosedown, synthetic down, or "memory foam," high thread count sheets, micro-fiber robes, and Spa Therapy toiletries. Cribs are available at no extra charge and cots are available for a nightly fee. One of the suites and two of the double rooms also have a pull-out couch. Charming inn in the heart of Sandwich. Clean with friendly service, though it does need some updating. Floors are squeaky, but for us, that added to the charm. When you visit, make sure to have dinner in the conservatory. This was our second time staying with these friendly people. The first review we mentioned that the TVs were not HD, otherwise this was about the best time we have had staying in an Inn or Hotel. This visit we had HD TVs and Cable. Everything else was as great as last time. All the staff is very friendly and welcoming, the restaurant food is excellent. We especially love the Tavern for supper. This year we discovered the Gathering Room for reading or playing cribbage. For more fun in the water, Sandwich's Town Neck Beach is less than a mile away, with plenty of parking and a long sandy beach fronting Cape Cod's calmer bay side. The beach is especially ideal for families since it is bordered by a saltwater creek which offers even calmer water for swimming in along its sandy banks. The inn's location in the middle of historic Sandwich also puts it within easy reach of many popular family- friendly attractions. Heritage Museum and Gardens is a sprawling museum dedicated to 200 years of Americana, with everything from antique cars to a windmill and carousel. Also fascinating is the Sandwich Glass Museum, which includes beautiful exhibits of colored glass as well as demonstrations in glassblowing techniques. Younger kids will especially enjoy the Thornton Burgess Museum, dedicated to the children's author of such indelible characters as Peter Rabbit. In summer, the museum offers storytimes and walking tours of Sandwich with a Burgess impersonator, which is a great way to explore the quaint little town. A little farther afield, the Woods Hole Science Aquarium is a small but extremely well curated aquarium with touch tanks and other hands-on exhibits to teach kids about the denizens of the surrounding ocean. The Dan'l Webster has two restaurants, both of which are family-friendly. The Tavern is billed as an "authentic replica" of the 19th century tavern frequented by Daniel Webster himself -- and it certainly feels the part, dim-lit and cozy and filled with heavy dark-wood tables it manages to offer a nice pubby feel while still feeling comfortable for kids. The Main Dining Room, meanwhile, inhabits a glassed-in sunroom that fills with light at breakfast-time and offers a romantic view of brightly lit fountains outside during dinner. At both establishments, kids are provided with crayons and activity mats to make the meal go down easier, and high chairs and booster seats are available. The menu, which is the same in both restaurants, is broad-ranging and eclectic, with something to please everyone. Traditionalists will find all of the old New England favorites -- prime rib, veal scaloppini, seafood stew, and poached lobster among them. Even while working hard to please Cape's population of seniors, the chef here has clearly tried to distinguish himself with more creative offerings -- such as an Asian-flavored wok-fired salmon and a signature "beef crabioli," kobe beef-and-truffle filled raviolis topped with butter-poached crabmeat and bearnaise sauce. The menu only suffers, perhaps, from its ambition. The chef seems to be trying to do too many things at once to really qualify as a fine-dining establishment, while its clearly still a cut above most family dining establishments. The kids menu, for one, is definitely a cut above average, featuring a broiled haddock dinner in addition to the standard chicken fingers and mac n' cheese. The pizza is a highlight, coming with a wood-grilled crust, and all items include a vegetable, even when they are served with fries as well. Desserts are also a highlight for kids and parents alike -- the menu bizarrely departs from its fine-dining image with laminated photos of all of the desserts a la Friendly's. But there's no question that the more than a dozen offerings ranging from "peanut mouse pyramid" to "chocolate lava cake" look -- and taste -- delicious. The resort's Beach Plum Spa offers a bit of everything, with local beach plum berries worked into many of the products used in massage and body treatments, and medical procedures such as botox and laser treatments among the offerings. The spa is especially accommodating to families, offering mani/pedis kids as young as 5 -- including a whole kid-friendly line of treatments such as a "strawberry ice cream manicure" and "chocolate milkshake pedicure" -- and parent-child massages upon request. 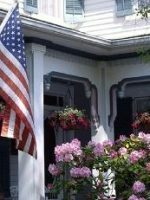 The Dan'l Webster is open year-round, and its cozy New England inn atmosphere makes it a welcoming property even during the wintertime. Of course, the best time to visit is during the height of summer in July and August, when the weather is sunny and hot, and the Cape is in full swing. A trip during the "shoulder season" of June or September can be a great option, however, to save a little money -- rates are lower, but oftentimes the weather is just as nice (and not as humid as it can be in August). The Cape tends to shut down after October, and doesn't really open again until April. So if you are visiting between these periods, don't expect to have a lot of dining options outside the inn. While there is an austere beauty to the Cape in the snow, recreational activities are few -- so bring a good book and lots of activities for the kids. 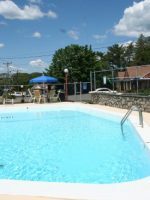 Sandwich is located a little more than an hour from Boston along Routes 3 and US 6. (Leave more time, however, during peak summer weekends.) It's a bit under five hours from New York City, along Interstates 95, 195, and 495 and US Route 6. The closest full-service airport is Boston's Logan International Airport, which offers flights from all major domestic and quite a few international locations. You can rent a car at the airport, arrange car transportation from Logan through Cape Destinations for about $150 each way, or take a bus to Sagamore, a short car ride from Sandwich, for about $25 each way with the Brockton & Plymouth Line. It's also possible to fly from Boston to the regional Barnstable Municipal Airport, where you can also rent a car or take a cab to the inn. Among the airlines making the trip are Cape Air, Island Air, and Nantucket Airlines, all of which also fly between Hyannis and Nantucket and Martha's Vineyard. Cabs are available at the airport. 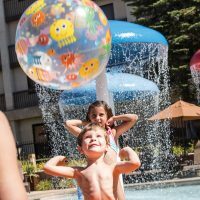 In addition to the spa located en premises, the inn also offers some extra perks for mom and dad, including access to Sportsite Fitness, a fitness club less than a 10-minute drive away; and tee times reserved at Ridge Club, a private 18-hole golf course nearby.